How early can I start sowing vegetable seeds? We all get impatient for winter to end and the growing season to start, but it’s not a good idea to sow your vegetable seeds too early. Seeds sown into cold, wet soil without enough daylight are likely to rot (or get eaten by hungry birds or mice!). One solution is to start off your seeds inside, which will overcome the problem of cold and damp. However, you will still have problem with a lack of daylight if you sow too early in the year. All seeds need warmth, air and moisture to germinate and most need plenty of light. Otherwise they will grow ‘leggy’ with weak stems – see the comparison below. 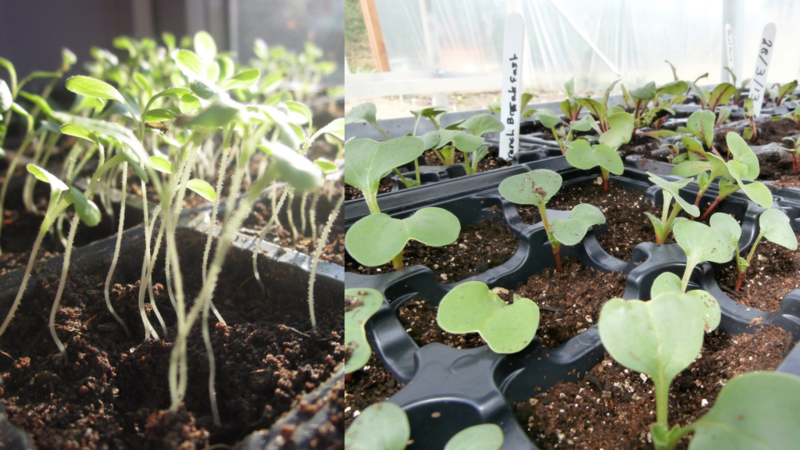 The seedlings on the left are growing on a windowsill indoors and leaning towards the light. As a result they have developed weak stems and pale leaves. Those on the right are in an unheated polytunnel and have grown more slowly with sturdy, strong stems and darker green leaves. So if you want to start off some vegetable seeds in January or February put them in an unheated or frost-free outdoor, covered space if you can. If you only have a windowsill to grow them on, put them in a cool room with plenty of sunlight and turn the trays or pots every day to avoid the ‘leaning’ effect! When should I sow different vegetable seeds? Different vegetable seeds thrive in different conditions, so to get the best out of them you need to pay attention to what they like! 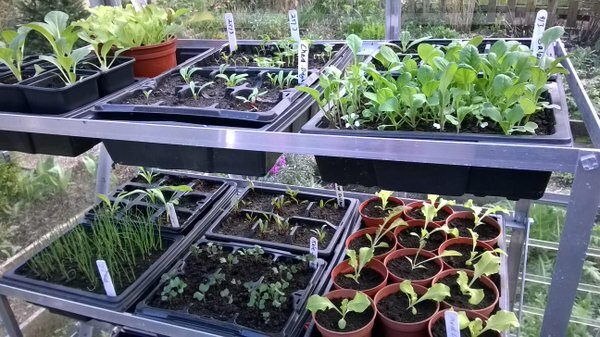 First we’ll look at seeds sown INSIDE (ideally in a cold or frost-free greenhouse, polytunnel or cold frame). For general indoor seed sowing advice see my blog on Annual Flowers. Tomato seeds need to be sown in January, but will need plenty of warmth to germinate (about 20 degrees C). Once the shoots and leaves have appeared you can reduce the temperature so that they grow sturdy stems. 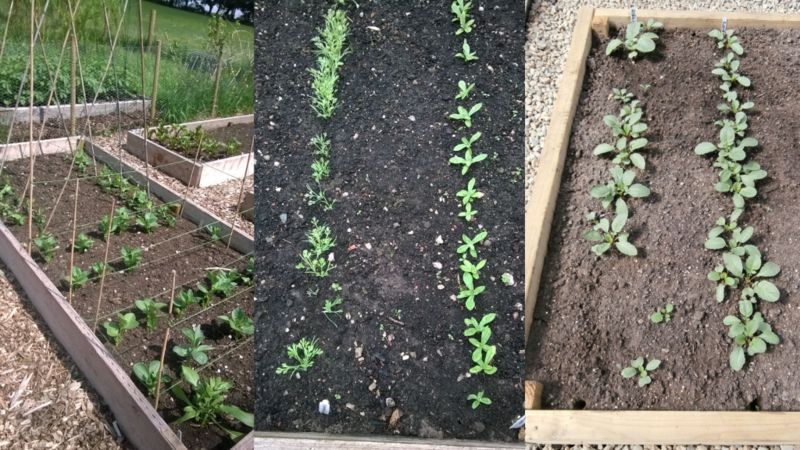 Lettuce, radish and onions will also germinate if sown in late January and do not need particularly high temperatures. Now for seeds that should be sown OUTSIDE directly into the ground. While you are waiting to get sowing you could mulch the area you are going to grow in. Add chicken manure pellets or a general purpose fertilizer to the soil about 2 weeks before you sow your seeds. If the weather is dry, water the soil just before you sow the seeds. If you are growing peas or beans that need support to climb up, put these in place BEFORE you sow, otherwise you could damage the plant roots. Check the packet to see how deep and far apart the seedlings should be. The reason that most vegetable seeds are sown in long straight rows is so that you can label the row and then tell which seedlings are vegetables and which are random weeds! Remove any weed seedlings asap so they do not crowd out your vegetables. Keep watering the seedlings if the weather is dry. You can also plant Early Potatoes at the end of March, as well as ‘Sets’ of Onions (these are the tiny onions that will grow large enough to harvest by June/July) and garlic ‘cloves’. 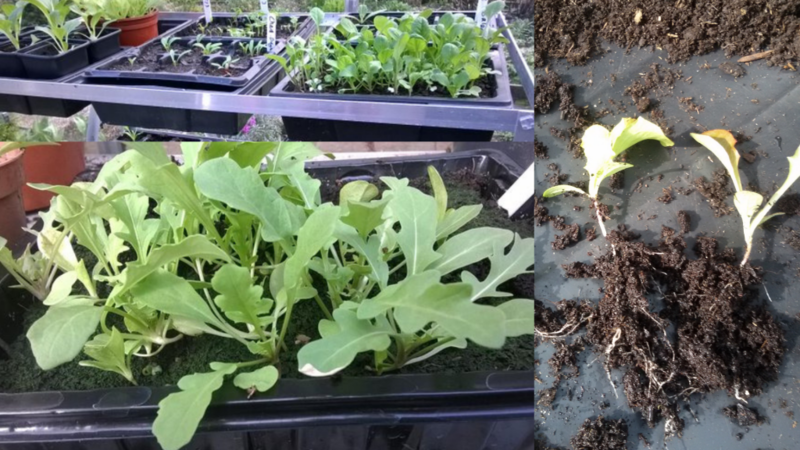 By the middle/end of the month you can plant out the small Lettuce, Radish and Kale plants you started from seed inside. Sow Courgette, Cucumber, Squash, Pumpkins, French and Runner Beans. See my blog on Raised Beds, Vegetables to grow in pots or containers or come along to one of my workshops. You could also have a look at this You Tube channel created by the Market Gardener and Garden Writer Charles Dowding.